Equestron - And you thought Iguanos was strange! This one is definitely out there, although the chariot piece has a Microman quality to it. As is the case with Iguanos, Equestron is a prototype only, as far as can be discerned. It is not known how many prototypes exist or were made. 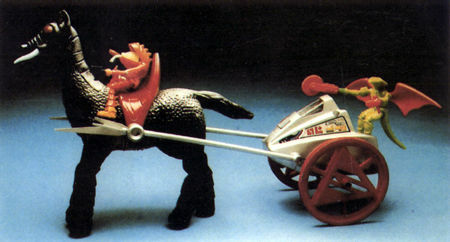 Equestron was also scheduled to be produced in the 5th series of Micronauts. Shown here from a dealer catalog, with Lobros commanding the reigns and Repto guest-starring as Charlton Heston!